If you are committed to achieving big things in life, this amazing tool could keep you inspired for your goals and in a positive mindset... helping you to manifest the prosperity you deserve! This company OrangePeel Ltd has come up with a way of visualizing your goals and dreams by displaying your dream images, affirmations and power words on your computer screen. I though it was an interesting idea and decided to get a copy. Now that I have been using "Vision Board" for a couple of weeks, I thought I should share some of my impressions with you about whether or not it lives up to the promises that OrangePeel Ltd makes about it on their web site. Is it really that easy to use? Would it really be that flexible and fun to create a personalized Vision Board? And what it comes down to: would it really keep me in a positive mindset and inspired to reach my goals and dreams? The first thing that impressed me was how easy it was to order the product and get the download. I think I was actually putting pictures into the system after less than 10 minutes of ordering and I straight away received a stack of bonus products as well with my download. So that was a great start. Another thing I thought was really excellent was the simplicity of the system. It is simple, yet powerful. I had a little play around, and got more and more excited as I discovered how easy it was to put my Vision Board together. I am always relieved when things actually work right the first time, and when the system is fool proof for people like me who are no computer geniuses. You can't go wrong with the three simple steps they take you through. Even my 9 year old son could easily create his own Vision Board. So then I really got stuck into it and found myself searching for inspiring images in my own gallery to include in the tool. I also checked out the image library that is included in the software, they had some cool pictures for me to use. I also found a fantastic picture on the Internet of my dream car. Really exciting to see that moving around on my screen all the time, talking about inspiration! I started to come up with powerful affirmations to add to the pictures. The features that really impressed me were the libraries that come with the software. If you don't know how to formulate an affirmation or power word, or just need some inspiration just use the library packed with great affirmations and power words. You even get to choose the font and color of the affirmations that come up and you can decide whether to use colors or an image as your Vision Board background. I chose a picture I made on one of my travels of a beautiful ocean outlook, which inspires me to travel more with my family. Once I put my Vision Board together with my images, affirmations, power words and my chosen background I thought "right, let's see if this really works..". So I clicked on "Preview" and pop there was my Vision Board showing on the screen! Wow, I felt as excited as a little child. I decided I wanted to change one of the affirmations, which was so easy to do. I like that a lot, as my dreams change from time to time so I can just adjust my Vision Board accordingly. OrangePeel has JUST very recently released their latest edition Vision Board. Apart from all the powerful existing features, this "next generation Vision Board" includes some very excited extra modules. Firstly, it includes a valuable Audio Module. This module allows you to incorporate mp3 music and voice recordings into your Vision Board, which will then play anytime your Vision Board comes up. Also, it features their fantastic new Poster Creation Program, enabling you to freely copy and paste images and text on a Poster on your screen, which them can be taken to a print shop. So I purchased a copy of this newest edition straight away, and I just LOVE it. To be honest, I didn't think they could do a better job than they already had, but this really is a step up once again from their previous version. 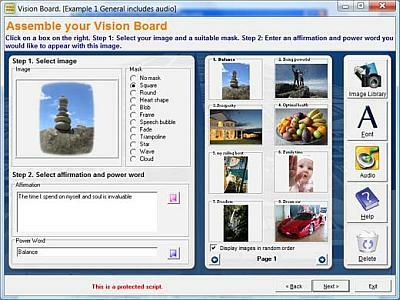 I believe these extra features make Vision Board truly the most complete manifestation tool available anywhere! I am equally amazed how inspired I actually am by this Vision Board. Sometimes I just bring it up on my screen to have a look and get focused again. I lean back and look at the dream images on my screen, listen to my favorite song and really feel what it would be like to have that car, or to go on those travels. This truly inspires me to take massive action and I know by feeling as if I have already achieved it, I will attract it to my reality. This is what I have learned about The Law of Attraction: the more positive energy you give to your goals, the faster you will manifest it. When I turn on my computer in the morning my Vision Board shows as the wall paper. When I come back into my office after lunch or a meeting, my Vision Board is right there showing as the screensaver, so it makes me get right back to business. Vision Board even features a little pop up balloon displaying your affirmations and power words, which increases the exposure to these affirmations and power words and helps adjusting your belief system. Oh, I almost forgot another amazing feature. After a while I discovered the "export" function in the software. Wow, I realized I could actually send my own Vision Board to my family and business partners! What a cool way to inspire them as well. So I send one to my partner who called me after half an hour saying "wow, what a cool way of keeping focused, where did you get this? I want to create my own one". Oh, did I mention that you can also print our your Vision Board? I have printed a couple of copies and hung them everywhere around the house. It drives my wife nuts, but hey I know it works! I even have been able to display my Vision Board on my PDA, thanks to this amazing "export to mobile devices feature"
I guess you know by now how impressed I am with this tool. I could go on and on about it... But here's the bottom line: this software does absolutely everything it claims to and is a MUST for anyone serious about attracting huge success and abundance and wanting to keep inspired. It is just so complete and it makes so much sense to own one. I give this product my absolute highest recommendation. Oh, I almost forgot: this is a very good time to check out this product as they offer an amazing set of free bonuses. So make sure to not miss out on their mind blowing bonus package valued at over $1000, including bonuses from Eva Gregory, Ruben Gonzalez, Jim Driscoll, Vic Johnson, Lee Brower and Jim Bunch, to name a few. I actually think this bonus package in itself already more than worth the investment! to read more about this powerful visualization tool, and how it can help YOU to attract the prosperity you deserve!